Luk Van Langenhove at UN Day in Paris. Photo: UNESCO. On 24 October, the United Nations University Office at UNESCO, Paris (UNU-OP), together with the the UN Regional Information Centre and the Académie Diplomatique Internationale (ADI), celebrated UN Day 2011 with a special event on the theme of “Building a Global Constituency for the UN through Public Information.” The event explored ways to reach out to new audiences and strengthen their understanding of the UN’s central role in addressing pressing global challenges. Speaking at the event, Dr. Luk Van Langenhove of UNU-OP explained the role of UNU in sharing knowledge across borders and serving as “a bridge between the UN and the global community of scientists”. “Thanks to its unique identity as both a United Nations organization and a high-level research and training institution, UNU is able to contribute directly to the advancement of knowledge relevant to the role and work of the United Nations”, he said. Other guest speakers at the event included Dr. Timothy Ryback, Deputy Secretary General of ADI, and Cécile Molinier, Director of the UNDP Office in Geneva. They were joined by Jean-Pierre Bugada, Chief of Communication for France and Monaco at the UN Regional Information Centre; Jacques Rao, Director of the UNESCO Division of Relations with Members and International Organizations; and Solange Montillaud, Chief of Communications at UNEP in Paris. In opening discussions, Jean-Pierre Bugada explained that the challenge for the UN system today is to adapt to new information technologies, which, though excellent communication tools, risk leading to disinformation if badly handled. Cécile Molinier took the floor to share the communication and coordination experience of her organization (UNDP), which frequently acts as the voice of the UN in the field. She stressed the importance of all international organizations “to deliver as one”. Jacques Rao shared UNESCO′s communication strategy, highlighting its base in innovative methods designed specifically for the diplomatic community and the general public. At the global level, UNESCO focused on the defence of information, freedom of expression and protection of journalists, he said. 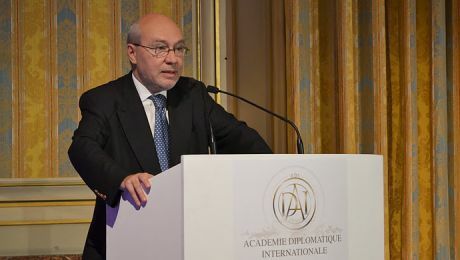 The event took place at the Académie Diplomatique Internationale (ADI) in Paris, an independent institution dedicated to promoting modern diplomacy and contributing to analysis of emerging dynamics in international affairs. The proceedings of the UNU Day event were in French. The event attracted diverse participants, including members of the UN family and NGOs, diplomats and officials from the French Ministry of Foreign Affairs, and students.